The dig, which began six weeks ago, uncovered all manner of neolithic treasures including a 4,500-year-old dwelling as well as pottery, flint and bones. Archaeologist Jim Leary from English Heritage said the findings were very significant. "The level of preservation is just phenomenal," he said. "We don't have a comparison in England. We could never have imagined we would come across this." The world's media has descended on the site throughout the duration of the excavation work. Jim said: "It's fantastic and I think it really shows how people are engaged with their heritage and their land. It's really important at this time that archaeology can engage people and give something back. "As archaeologists, we have to let people know what we've found. We're doing this for the public, we're telling them all about it, and that's why archaeology is so important." 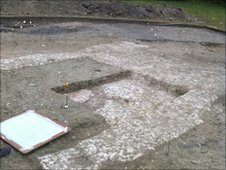 Fellow English Heritage archaeologist, Paddy O'Hara said of the building they uncovered: "It's just unparalleled. I've never seen anything like it at all apart from Skara Brae in the Orkneys. The preservation of this building is just superb. "I was here about a fortnight ago and I was, quite frankly, sort of sceptical. People were saying 'oh, maybe there's a building here', but I really wasn't convinced. "Just walking up here now, the thought that I could have missed this would have been heartbreaking, as it's just a fantastic bit of archaeology.